Author of American Muslim Women, Jamillah Karim, and co-author Dawn-Marie Gibson, Professor of History at Royal Holloway, University of London, recently published Women of the Nation: Between Black Protest and Sunni Islam. In a field certainly undervalued and understudied, this research contributes to expanding the perception of Islam in America more broadly and uniquely opens a conversation between Muslim women, themselves, through ethnographic accounts of women’s experiences in the Nation of Islam and women of the Sunni Warith Deen Mohammed community from the 1930s-present. The book also seeks to respond to a feminist narrative that has characterized women’s experiences within the Nation of Islam as largely unfavorable due to the upholding of traditional gender norms. The book unfolds in a traditional manner–outlining the history of the Nation of Islam, with particular attention to Elijah Muhammad and Malcolm X. However, unlike other critical works, we are given access to women’s participation, thoughts, and opinions during key moments of community transition such as the death of Elijah Muhammad, the leadership of Imam Warith Deen Mohammed, and the present state of the WD community and NOI within the larger ummah (Muslim community). Needless to say, the book covers a breadth of information and host a collection of insightful vignettes; however sometimes it can feel like you’re just reading a collection–which isn’t a bad thing but it reads as less of a critical analysis. Now there are certain points where Karim and Gibson deliver this and it’s great. Take the way women from the WD community identify “freedom” as demarcated from Nation women as told by Karim and Gibson. If women are given freedom to excel in academic pursuits, how can we tell them to stay home? What is all this education for? You can’t keep [women] at home to nurse babies. The ways in which women have articulated this freedom whether it be in pursuit of secular or religious education– and, in many cases, both–is fascinating. There are women who became nurses to better serve their community, directors of schools for Islamic education, and more recently women that are pushing the boundaries of religious leadership and officiating weddings. While I always appreciate deeper work on women and African American Muslim communities, I’m always disappointed that it is more often than not exclusive of African American Muslim youth. What is the narrative of the youth that are products of this earlier generation? How are they connecting with this history (if they are) and how does it influence their thoughts on Islam, Muslim identity, and participation in the “ummah”, if at all? I say that knowing that this is not the aim of this particular book but something I would have liked to see. 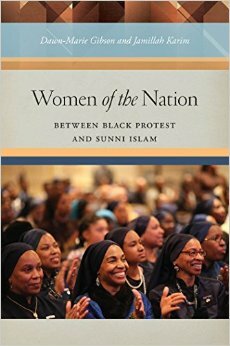 With that said, Women of the Nation is a great source for an introduction to uncovering the relationship between race and community through the lens of African American Muslim women.